I believe that you should be in the know about your blog writer, their affiliations and associations, as well as their relevant monetary interests. Since there's no time like the present, I'll give you my full disclosure now. I'll divide them up into sections below and always keep you updated on any changes! You can learn more about why I started this blog here. I am a Medical Doctor (M.D.) with a strong research science background. (I consider myself more the scientist, cause I'm just geeky like that). I am a doctor, but I am not your treating physician. My blog, its posts, and any suggestions are for informational purposes only. This blog is NOT intended to be used for the prevention, diagnosis, or treatment of any disease. Please speak to your health care adviser regarding any changes or alternatives available for your treatment. I have a private line of natural oil based products, carefully formulated to be both safe and as natural as possible. These were formulated to compliment my private medical practice. I do not have any financial interest in any of the products discussed in my blog. My personal belief is that, in general, the safest long-term skincare should be based on naturally derived products and ingredients. Natural oils are some of my favorite ways to moisturize and care for the skin. I give you my word: this blog will NOT be swayed by ANY third parties and is dedicated to finding out the truths in skincare, whatever they may be. I love responsible consumer advocacy. I have no tolerance for lies, deceit, and the manipulation of people, especially for financial gain. These are the reasons I once founded my skincare company, and, they are the same reasons I founded this blog! I do not rely on people or companies sending me free stuff! If ever I blog about something that was given to me as a gift, I PROMISE I WILL SAY SO AT THE BEGINNING OF THE POST. In all honesty, I doubt I would even blog about a skincare product that was sent to me for free. To this day, although offered many free products, I have not accepted any as yet. If there were ever to be advertising on this site, I can promise you that I must whole heartedly support what is being advertised. I would not accept advertising from any company unless I can stand behind what they sell, period. For me blogging is about giving my readers the tools they need to navigate through our often deceitful skincare world of claims and empty promises. It's not about the product reviews, and it's certainly not about appeasing third parties. As far as I am concerned, this blog is solely for me and my readers! This make for a healthy relationship. Third parties often come in and ruin the party! 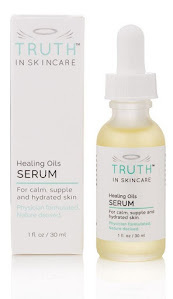 So I promise that I am here for you, my readers, and that is the only reason I blog for TRUTH in SKINCARE!